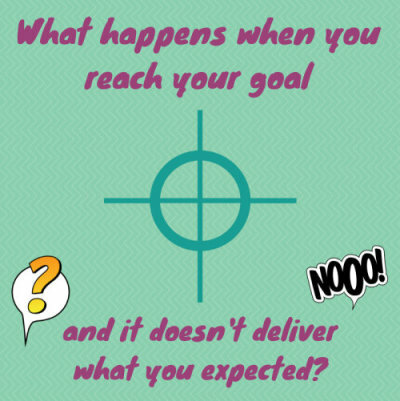 What happens if your goal doesn't get you where you wanted to be? What happens if you work towards a goal, you reach it, and nothing's changed? What if you dream of being a size 12, but when you buy your first size 12 jeans you just feel the same? What if you work to get your product in a glossy magazine, you see your item in print and yet your sales don't change? What if you dream of getting a partner, find one, fall in love, but don't really feel as 'whole' as you'd hoped? What if you dream of a promotion, you get it, and still feel the same about your career? It can feel a little disheartening if you achieve the goal you had your heart set on, and the outcome just isn't what you expected? When I started my business, I definitely viewed being featured in the press differently than I do now. To begin with I expected that being featured in a mainstream glossy would be pretty transformational. I was wrong. I've been in quite a few magazines now, and although they definitely hold a value, as a piece of marketing in themselves they hold little monetary value. They are instead great building blocks that can be used to build other opportunities. On the other hand, losing some weight has actually been like what I expected. Maybe I held realistic goals, or ....perhaps....controversially...losing weight in a healthy manner can just be a positive experience. How to move forward when you feel lost? How do you keep moving on, when you thought you'd reached the point you'd needed to be at? How do you find the energy to move the goal posts and keep striving? Begin by acknowledging the achievement with a different measurement. You may not have had the outcome you'd hoped for, but there is still a lot that can be gained from whatever it is you reached. What lessons did you learn? What could you do again, bigger and better? Can you turn the outcome into a stepping stone for something more tangible? Achieving any goal is worth celebrating, regardless of the precise rewards you'd hoped to receive. Celebrate them all. They are all movements forward, and stepping stones to your future. The experience can be a great re-focuser as to what your future efforts should be working towards. Take a step back, and find other ways to hit your original goal. Maybe extra sales (or happiness, or satisfaction) are attainable from methods you'd previously discounted.